When you monitor your alarm with Wiring Solutions you are entering into an agreement with a company that takes your security and peace of mind seriously. Your personal information is never mishandled. Every employee from the field technician to the receptionist have passed an OSBI background check and have their personal information on file with the State of Oklahoma and other governing agencies. We have also completed the rigorous background checks necessary to be a security contractor for the State of Oklahoma, U.S. Military, and the Federal Transfer Center, just to name a few. 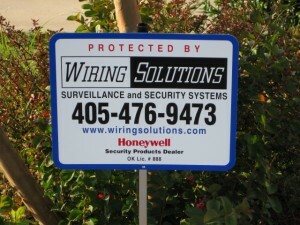 Wiring Solutions offers a full factory warranty on all of our security equipment that we install and monitor. We continually update procedures and receive factory training for the products we install. This ensures you receive the highest quality service and attention. Many budget monitoring companies employ installers with little or no training and licensing, and we have received numerous calls from frustrated homeowners who have dealt with this firsthand. Take full advantage of this warranty by only allowing Wiring Solutions to service and monitor your equipment. Your system is monitored by a U.L. Listed and Registered Central Monitoring Station based here in Oklahoma. This means we have met and are required to maintain certain standards such as response time and building security measures. Highly trained Oklahomans professionally handle your emergency with the priority it deserves. It is important to note this as many central stations are based in other states or regions and getting the proper response when seconds count is what really matters. So many alarm companies compete by lowering their prices or with catchy slogans making other providers sound expensive. If all they can do is tell you about their low prices, low prices are probably all they can offer. Many will install a completely proprietary system that cannot be serviced by anyone but them. If you become dissatisfied with their service you have no option for anyone but them to manage your account. These “bait and switch” tactics are what allows them to offer that low rate. Unfortunately, you are locked in to their contract long before you discover these hidden gems. Wiring Solutions offers a competitive price with NO hidden fees, then we back that up with superior service, more technicians, more trucks, and more of the things that will matter to you long after that budget pricing is forgotten. An alarm company offering more service at half the rate of others, or hundreds of dollars worth of equipment free should be considered suspect. A profit must always be made so that employees can be paid and trucks maintained. Many companies will look enticing with their offers but a savvy consumer will be able to understand that offers that sound too good to be true are. Our monitoring rates are simple and straightforward. We have no hidden taxes, fees, or annual rate increases like most national companies. In fact, we pioneered the “straight-rate” pricing structure that many companies follow now in Oklahoma. Wiring Solutions does not sell your account to a third party like many companies will. Interestingly enough, most of the local and even many national companies will act as brokers to large funds that simply buy accounts by the batch. In many cases this practice will leave you with an out-of-state number to call for service, then talking to a person who cannot even service the system as they are simply an investor in your account. This is a regular practice for a smaller company, such as one that advertises to be a dealer for a nationally known company. This practice alone is what leads so many people to become disgruntled with security alarm companies. We believe in our services and if you do too, enough to refer us to your friends or neighbors, we want to compensate you for your efforts. When you refer us to anyone (they must mention they were referred by you, and your account must be active and in good standing) we will credit your account two months of basic service! Refer seven people to us and your Alarm Monitoring becomes FREE For Life! See additional details about the Free For Life program here. Now of course the person you refer must become a monitored customer for you to be credited, other than that, it is just that easy. When you call our offices you speak directly to a Wiring Solutions account manager who has all of your pertinent information at hand and can make decisions based on your needs. You will find our high level of customer service training will put your mind at ease when dealing with your account. Should your alarm system need service, you will see our clearly marked company vehicles, professionally trained, uniformed service technicians who will ensure your system is operating and all of your questions answered. Peace of mind and trust are included at no additional charge! PLEASE NOTE: Wiring Solutions assumes no liability when an alarm fails to communicate due to the switching of phone service providers. It is recommended you test your alarm while the phone company is still on site to ensure they have the alarm reconnected properly as many times they will not. This is a test we will be happy to assist you with, over the phone, at no additional charge. However, additional charges will apply if a service truck dispatch is needed to reestablish alarm communication. Additionally, certain types of new phone service (VOIP and others) are not compatible with certain alarm equipment without additional hardware. Please see our VOIP disclaimer to help you make an informed decision.